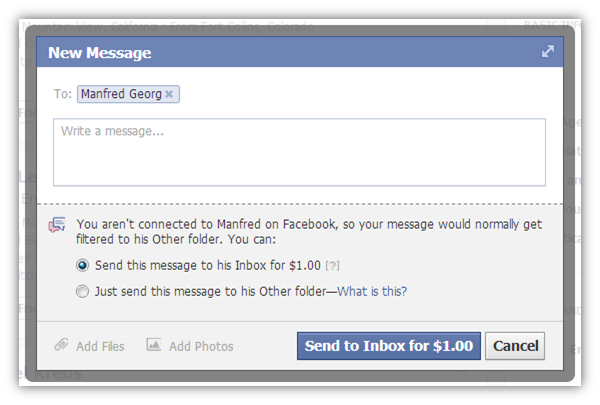 If you live in the U.S. – have you noticed that Facebook now charges $1.00 for you to send a message to someone that you’re not “connected to” on Facebook? If you’re in the U.S. and you don’t get a message like the one above when you try to send a message to someone you’re not connected to on Facebook – please let me know. As you can see, Facebook tells me I am not connected to the person on Facebook, so my message would normally get filtered to their “Other” folder, unless I pay $1.00. Perhaps it was only a matter of time, as Facebook essentially serves as the largest single repository of people in the world and they’ve been basically giving away the ability to send messages to over 1 Billion people for free. For years, sourcers and recruiters have been finding names of people through various research methods, including LinkedIn, cross referencing the names on Facebook and using Facebook to send messages to those people for free, avoiding the need to find their email address or pay for LinkedIn InMails. I know many recruiters who can attribute quite a few hires to this method of using Facebook for initial engagement. What is the “Other” Folder Anyway? 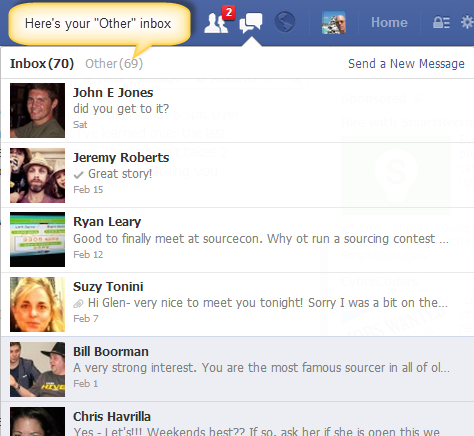 Did you even know you have an “Other” folder in your Facebook inbox? I am not sure how often the average person checks their “Other” inbox, but my guess is that it’s quite infrequent, if ever for most people. 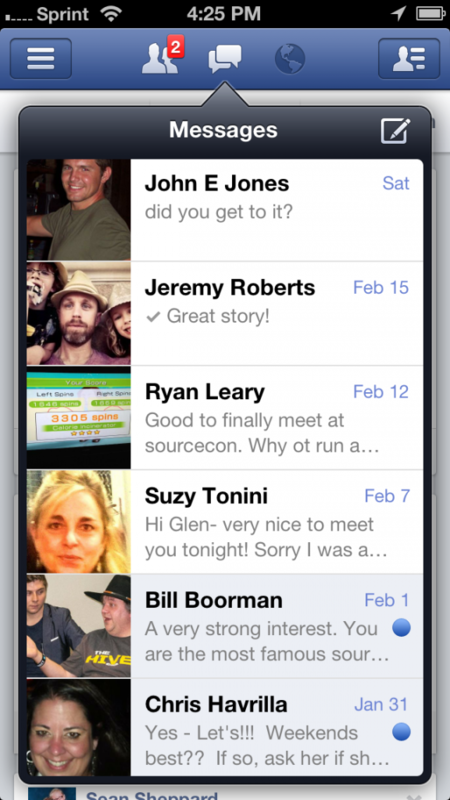 This means that the Facebook messaging efforts of many sourcers and recruiters are likely to go into a black hole. One the the biggest challenges with Facebook’s “Other” inbox is that it doesn’t show up on the mobile app, which is why it took me so long to discover it. This can be problematic for sourcers and recruiters looking to leverage Facebook to message potential candidates, because if you’re not connected to a person you’re trying to sending a message to, and that person primarily accesses Facebook via the mobile app, they might not ever see your message unless they go online and access Facebook and of course check their “Other” inbox. Which they may never actually do. Yep – the only messages I see are those that go to my inbox – from people I am connected to or people with whom I have friends in common. Unless I am missing something, there isn’t anything on the mobile app that would even suggest you have an “Other” folder in your inbox. If you did know about your “Other” inbox folder, I’m curious to know – how often do you typically check it? What Counts as “Connected To” on Facebook? You’re obviously “connected” to people you’re friends with, and from what I can tell, it seems that if you have friends in common with someone you’re not currently friends with, you probably won’t have to pay $1.o0 and your message *may* be delivered to their regular inbox and not be relegated to their “Other” folder. Facebook will likely consider you as not connected to someone unless you have some friends in common. However, even if you are friends with someone, there are certain situations in which you may not be able to get a message to the regular Inbox. From some testing I have been able to determine that even if you are friends with someone, if you send them a message with a hyperlink, and you’ve never exchanged messages with them before, your message will likely end up in their “Other” inbox. If you’re sending messages with links to jobs and such, beware. Also of note is that Facebook’s Inbox Delivery Test is apparently limited to the U.S. at the moment – great news for non-U.S. sourcers and recruiters, inasmuch as there is no $1.00 on sending Facebook messages to people you’re not connected to. However, keep in mind that your message may still be routed to the person’s “Other” folder, where it may never be seen. Please let me know if you’ve tried to send a message to someone you weren’t connected to on Facebook and have encountered Facebook’s “Send to Inbox for $1.00” option. Also, please let me know if you were already aware of your “Other” folder, and if so, how often you actually check it. As for the $1.00 charge for U.S. users to send messages to people they aren’t connected to – Facebook’s claiming this is only a test. However, I can easily see Facebook rolling out the “pay to message” functionality globally at some point to compete with LinkedIn’s InMail revenue stream. Could you fault Facebook for capitalizing on the need for recruiters to easily message people they’re not connected with? Mark Zuckerberg himself has already stated that one of his favorite uses for Graph Search is recruiting. Who knows, maybe Facebook is actually working on developing a recruiting solution…I’ve literally wondered for years why they haven’t already.